Our family divided our movie time up yesterday. The youngest sprout went with some friends to see the newest retelling of Exodus. She hated it, and I’ve never been more proud. She pointed out to me, blow by blow, of all the places where the film was absurd and inaccurate. Bravo little Greenbean, bravo! At the same time she watched that Mrs. Greenbean and I watched “Into the Woods” with the oldest sprout. The acting was great. I was very relieved, however, that Johnny Depp‘s presence on screen was short lived. 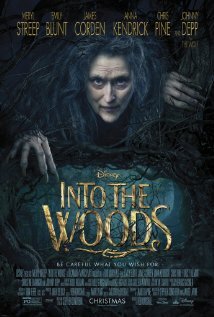 Meryl Streep came very close to over-acting, but, she’s Meryl Streep so she can get away with it. Emily Blunt, James Corden, and Anna Kendrick were all solid and the children, Daniel Huttlestone as Jack and Lilla Crawford as Little Red Ridding Hood were more than up to the challenge. 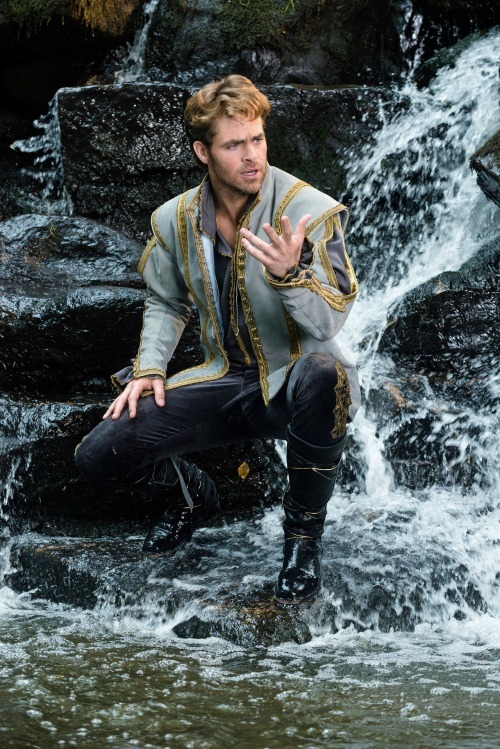 Chris Pine and Billy Magnussen nearly steal the show with their “Who is in the greatest agony sing-off” at the waterfall. Captain Kirk (Pine) really hammed it up, which kept it from being ridiculous, like that time James Bond sang in “Mamma Mia!” or when The Gladiator sang in “Les Miserables.” Remember those? How can we ever forget. Thankfully, this isn’t Mamma Mia! or Les Mis. The humor in the movie was good too, which was a credit to the writing and probably goes back to the Broadway show. The movie has dark overtones throughout, but the flippant and almost throwaway laugh lines keep it from becoming a complete downer. Along those lines, the best line in the film goes to Pine. “I was raised to be charming, not sincere.” Awesome. I DIDN’T KNOW THIS WAS A MUSICAL! I WAS TRICKED! Apparently my wife knew. I complained about this on Facebook and a friend asked me, “What did you expect from Stephen Sondheim?” My only answer was that I didn’t check the credits that closely. I had no idea. I also didn’t like the staging, technical effects, and look of the film. Seriously, at times it looked like Willow. The scenes with the giant woman were blurry and obscure and I think the whole thing was filmed on the backlot. How cheap was the set design? The Prince’s palace is relegated to the stairs. The village looks like it was borrowed from the television show “Once Upon A Time.” Speaking of which . . .
Another thing I didn’t like is that it felt like “Once Upon A Time.” In case you haven’t seen that show, it is a mash-up of every fairytale character you can think of, all living in one universe. That’s pretty much what “Into the Woods” is. I know that “Into the Woods” came first as a book and musical back in the 80s, but it is all beginning to feel a bit recycled. Guess what? Guess what? One of the previews informed me that they are making another . . . wait for it . . . wait for it . . . Cinderella. Just what we needed. The world is being overtaken by superheroes and fairy tales. Not much here–and notice I didn’t say hate, because, even though it was a musical (and for the record, I don’t hate musicals, I just have to be in the right mindset for them, okay) there was nothing I really hated. But I didn’t like the sexual innuendo found between The Witch and the Baker’s Father or between The Wolf and Little Red Riding Hood. I understand that it is pitching to adult audiences, but I just didn’t like it. I also didn’t like the sudden and capricious way in which characters died in the movie. No spoilers, just that when it comes, it comes with little exposition or explanation, and little emotional reflection by the survivors. There is one more thing I didn’t like. I didn’t like the way in which the movie changed about two-thirds through. I felt like I was a horse being ridden in one direction, watching one kind of movie, and then Ouch! the riders tugged the reigns hard in a different direction and forced me to watch a totally different kind of film. It really is a movie with a split personality. It starts one way, and then changes abruptly. I didn’t like that. My overall grade is C+. If you really like musicals, then you might rate it higher. Both Mrs. Greenbean and the oldest sprout loved the music and I perceive an iTunes download of the soundtrack will be coming forthwith.